Stellar Stainless Steel Kettle Used. Condition is Used. Dispatched with Royal Mail 2nd Class. Stellar kettle all hob types used no longer needed. Power to the glass kettle is supplied through the 360° base which makes it suitable for left or right handed use. 1.7 litre capacity. Jam & Chutney Making. REF: SEA35. Wrendale Mugs 6 for 5. Worktop Protector. Stellar Traditional Stove Top Kettle. For All Hob Types. Stainless Steel 2.0L. Good condition. Will post by Royal Mail recorded delivery. Stellar Stainless Steel Kettle 2.3l Very Good Condition. Condition is Used. Only selling as we don’t use it. Joules Clothing. Top quality 18/10 Stainless Steel with thick Thermic induction ready bases, suitable for all hob types. Capacity: 1.7L. Wrendale Mugs 6 for 5. Worktop Protector. Tools & Utensils. Tea & Coffee. Joules Clothing. Top quality 18/10 Stainless Steel with thick Thermic induction ready bases, suitable for all hob types. Capacity: 2.3L. Wrendale Mugs 6 for 5. Worktop Protector. Tools & Utensils. Tea & Coffee. Top quality 18/10 Stainless Steel with thick Thermic induction ready bases, suitable for all hob types. Capacity: 1.5L. Wrendale Mugs 6 for 5. Worktop Protector. Tools & Utensils. Tea & Coffee. Table Mats & Trays. Joules Clothing. Top quality 18/10 Stainless Steel with thick Thermic induction ready bases, suitable for all hob types. Capcity: 3.3L. Wrendale Mugs 6 for 5. Worktop Protector. Tools & Utensils. Tea & Coffee. Joules Clothing. Top quality 18/10 Stainless Steel with thick Thermic induction ready bases, suitable for all hob types. Capacity: 2.50L. Wrendale Mugs 6 for 5. Worktop Protector. Tools & Utensils. Tea & Coffee. The wide spout allows easy filling and equally easy to pour, with a removable whistling cap for a clear alert when the water is boiled. The wide base is suitable for all hob types including induction and cleans easily with a soft damp cloth. Joules Clothing. Top quality 18/10 Stainless Steel with thick Thermic induction ready bases, suitable for all hob types. Capacity: 2.9L. Wrendale Mugs 6 for 5. Worktop Protector. Tools & Utensils. Tea & Coffee. Joules Clothing. Top quality 18/10 Stainless Steel with thick Thermic induction ready bases, suitable for all hob types. Capacity: 2.0L. Wrendale Mugs 6 for 5. Worktop Protector. Tools & Utensils. Tea & Coffee. Joules Clothing. Top quality 18/10 Stainless Steel with thick Thermic induction ready bases, suitable for all hob types. Capcity: 2.6L. Wrendale Mugs 6 for 5. Worktop Protector. Tools & Utensils. Tea & Coffee. Top quality satin stainless steel with thermic, induction-ready base, suitable for ALL hob types. Featuring a removable whistling cap, wide spout making it easy to fill and pour and a sculptured phenolic handle Capacity 1.6L, approx. size; 20 x 22 cm, Stellar Lifetime Guarantee, Wipe clean with damp cloth. . Suitable for all hobs including induction and Aga. Multiple Orders. Gift Boxed. Stovetop Kettle. Whistle: Yes. Sculptured cast stainless steel handle with soft grip. Material: Stainless steel. Scotland – DG, EH, FK, G, KA, KY, ML, PA. Hob Type Compatibility: Gas; Electric; Induction; Glass. Suitable for all hobs including induction and Aga. 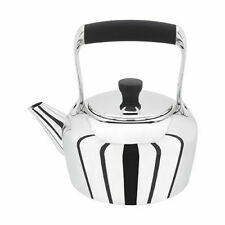 Traditional Stove Top Kettle 3.3L. Top quailty stainless steel. Multiple Orders. Top quality stainless steel. Thermic base. Suitable for all hobs including induction and AGA. Top quailty stainless steel. Multiple Orders. Measuring guide to promote energy efficiency - only boil the water you need Plastic free - water is boiled on stainless steel and in contact with glass Fast boiling, thanks to concealed 2200w element Led light ring power indicator, provides this kettle with a contemporary look Easy to fill push button lid with built in limescale filter Cordless - Kettle rotates 360° on base for right and left-handed use Auto cut off boil dry protection . Suitable for ALL hob types including induction. Characterful designs to suit the tastes of discerning stove users in UK and Ireland. Easy to fill, easy to pour. Top quality stainless steel with Thermic, induction-ready bases. Stellar Stove Top Kettle 1.7 Lt.
(2.6 Lt.) - Stellar Stove Top Kettle 2.3l. Horwood Homewards. (2.6 Lt.) - Stellar Stove Top Kettle 2.3l. Horwood Homewards.. Condition is New. Shipped with USPS Retail Ground. STELLAR THERMAL PADDED TEA COSY. Designed for use on Aga and Rayburn and are equally efficient on all the hobs listed below. Constructed from high grade 18/10 stainless steel. Heavy duty thermic base for efficient performance. Ideal for use on Aga and Rayburn. The Black exterior is high-temperature resistant, easy to clean and suitable for all hob types including induction. Great choice of classic and modern shapes, capacities and handle design. Top quality 18/10 stainless steel with thick thermic induction ready bases, suitable for all hob types. Pleasant whistling options.